June 1943 photo of the Gary IN Greek Mothers of World War II taken inside the Sts. Constantine and Helen Church there. On the back wall are photos of then-President Franklin Roosevelt, and Greek-American WWI Hero George Dilboy. CHICAGO - Little is known about the full spectrum of civilian programs supported by Greek immigrants during World War II. Some accounts do report on the Greek War Relief efforts and the singular role of Greeks in the war bond drives. Still, that is not the full scope, by any means, of Greek immigrant war work. Whey such sustained and diverse patriotic activities should escape general notice speaks more about those who write history than any other set of enduring factors. Complicating this set of circumstances one degree further is that unexpectedly, those involved in these war time programs came to enjoy their public service. How they expanded upon their war duties is yet another untold tale. What follows is an all too brief case study of one such organization and it's under reported contributions to aid local and national life. On August 29, 1943, in Gary, IN the St. Konstantine parish chapter of the Greek Phalanx of World War I called a meeting. These local Greek-American veterans of World War I called upon the mothers of those who had volunteered or been drafted to serve in the new war to attend. The purpose of the meeting 'was to establish an organization of these mothers to aid veterans and their families and to promote the serviceman's general welfare whenever possible.' It was unanimously decided to take steps in this direction. At that time temporary officers for this new organization were elected: Christina Harbelis, was elected president; Mary Anogianakis, 1st vice-president; Jennie Georgiadis, 2nd vice-president; recording secretary Katherine Glicofridis and treasurer Mary Apostolou. On September 17, 1943, through the efforts of Dimitrios Glicofridis, Gus Vasilatos, and Spiros Vlahos the mothers went through the procedures of applying for membership, through the state of Indiana, to the National Chapter of Mothers of World War II, Incorporated. On December 3, 1943, their request was granted and authorized by National President, Gretta Roush, as Unit 109 within that organization. At their fist official meeting 25 mothers became members and elected permanent officers Christina Harbelis, was elected president; Mary Anogianakis, 1st vice-president; Jennie Georgiadis, 2nd vice-president; recording secretary Katherine Glicofridis and treasurer Mary Apostolou; color guards and color bearers Sirmo Spaliaras, Georgia Maimonis, Helen Kotakis and Efthymia Georgiou; sergeant at arms, Stella Kaponis; chaplin Angeline Coveris and financial secretary Mary Pappas. While most certainly this gathering of ladies knew their own minds and the types of local and national service they could provide, they were not shy, in the early days of their organization, to call upon the advice and consul of local individuals such as Louis H. George, Nick Coveris and Dan Drakos. On Mother's Day 1944, the new Gary, IN Mothers of World War II Unit 109 (hereafter Unit 109) held a banquet to introduce itself to the community at large. The proceeds were used to send various items of food and clothing to servicemen in the United States and overseas. Hospitals in northeast Indiana quickly heard of the new Unit 109 and requested (and eventually obtained from this group) supplies and equipment for hospitalized veterans. Unit 109 engaged in nyumerous activities throughout the war. Some of their activities included the donation of food and clothing to needy servicemen and their families. Holidays were a special time of activity such that Easter, Christmas, New Year's, and so on provided times when these Greek-American mothers sent food, clothing, money, cigarettes and other supplies to servicemen overseas. Never forgetting the servicemen stationed in area camps the ladies were careful to see that these men received their attention as well. So service men passing through Gary were met with endless dinners and temporary housing. In time, given the increased traffic due to the war Unit 109 made sure housing was always available to servicemen at the local YMCA. 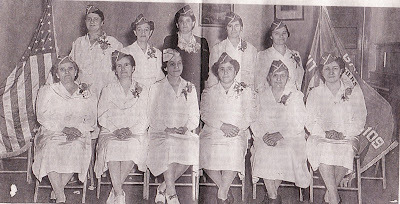 "The Greek Mothers of world War II, Unit 109, at their recent monthly meeting completed plans for sending a gift to the Billings hospital in Indianapolis and since have made this donation as well as a gift of seven and one-half pounds of rayon, silk and nylon hose to the veterans' administration in Marion. Serving a dinner recently at the service center was another part of the contribution to the war effort. The addition made to Billings' hospital supplies included 14 bed sheets, 5 linen handkerchiefs, and 8 dozen tray napkins." Unit 109 was so active in its war efforts it is difficult to present all that they accomplished without reducing their efforts to a long list. During Christmas holidays Unit 109 members were known far and wide for sending as much as 150 pounds of chocolates at a time to servicemen overseas. Among their ongoing donations to hospitals Unit 109 provided monies expressly for new books. Aside from what we have described so far Unit 109 assisted with the war bond drives by sponsoring a local booth. And in typical style such were their collective efforts that the unit received a citation from the Secretary of the Treasury Fred M. Vinson commending their accomplishments in selling victory bonds. Before we go any further it must be stated that some of the women in Unit 109 wanted something for themselves for all their sustained efforts. And they weren't afraid to let others know about it or to petition for it openly. From an undated newspaper clipping we read the following: "Request for the granting of citizenship to 12 Gary mothers of World War II veterans is on its way to the house judiciary committee today, thanks to the help of Gary's International Institute. 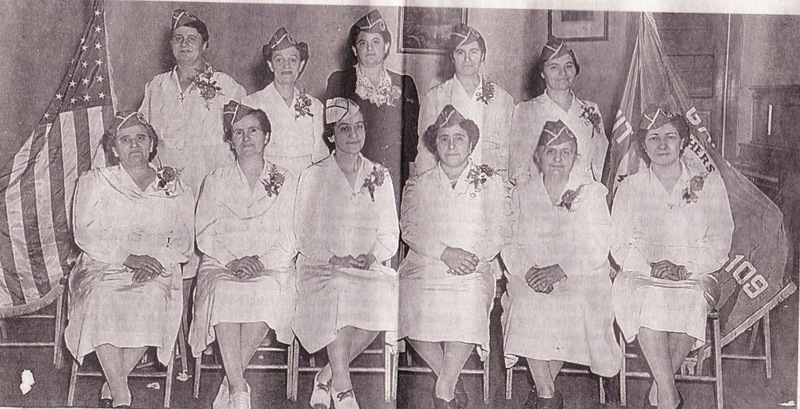 All the women are of Greek descent and members of chapter 109, Mothers of World War II. To date their efforts to get citizenship papers have been to no avail. "Some of the women are blocked because they can neither speak or write the English language. Others, although they have filed for citizenship papers several times, have been held up by red tape and parliamentary delay." In time these women received "the price" they had more than earned, American citizenship. At the end of the war Unit 109 planned and hosted a gala victory dance in honor of the returning servicemen at the Hotel Gary ballroom. One would think that this event would have also signaled the triumphant end of Unit 109 but that was far from the case. Unit 109 did not disband but continued in its work to aid local hospitals as well as other worthwhile projects not just nationally but around the world. A few of the projects to which Unit 109 offered its aid included, but was certainly not limited to, were donations made annually to Queen Frederika's fund for the orphaned children in Athens. Contributions were made to Patras, Greece for the express purchase of books and school supplies for these orphaned children. Donations were made annually to blind servicemen in Greece. Ever alert to the complex political circumstances caused by total war Unit 109 members enlisted the assistance of Gary mayor Eugene Schwartz (1950-1951) to come to the aid of the children displaced by the Greek Civil War. Unit 109 was as active in local and national programs as they ever were during the war. One newspaper clipping dated simply as 1953 quickly itemized some of the Unit's programming for that year: "they included contributions to the Red Cross, the Cancer Fund, the Lake County Crippled Children's Society the Polio Drive, the Community Chest and SS Constantine and Helen's Church. Gifts were sent to Parramore Sanitarium and to seven state veterans' hospitals; to veterans overseas and stationed in this country, and veteran's orphans were assisted." Unit 109 always seemed to keep up with the changing times as their gift of a television set to the Billings hospital attests. Every Memorial Day Unit 109 also held services each year for the four soldiers killed in action that came from their community: Jim Logan, George Panagiotopoulos, Franklin Saetes and George Cralis by placing a wreath of flowers at the veteran's monument in the church yard. The Mothers of World War II, Unit 109 celebrated both their twentieth and twentieth-fifth anniversaries in typical style; they gave a banquet for others each time. I do not know when or even if Unit 109 ever disbanded. Unidentified news clippings report that the Unit never numbered more than 64. It is worth noting that the phrase 'The Greatest Generation,' coined by journalist Tom Brokaw, describes "the generation who grew up in the United States during the deprivation of the great Depression, and then went on to fight in World War II, as well as those whose productivity within the war's home front made a decisive material contribution to the war effort." The activities of Unit 109 does credit not only to their community but to all other Greek-Americans across the nation. More deserves to be known about them and their dedicated service.